Secretive suitors and supernatural specters tinge the pure, romantic love story at the heart of perennial ballet favourite Giselle. Peter Wright’s lovingly traditional production remains a jewel in the crown of the Royal Ballet repertoire, making a welcome return for a season that will also include a worldwide cinema broadcast. John Macfarlane’s designs make the forest setting appear as if a vivid watercolour painting has come to life. Solid boughs and bracken add texture to the use of painted backdrops. Soft autumnal tones on the costumes, as well as the foliage, create a most appealing picture overall. The formal, decorative costumes of the royal party add an extra touch of spectacle, as the pageantry of act one builds in visual splendour. Act two’s graveyard setting ties in neatly to the first setting, with gallons of smoke from dry ice to set the mystical scene. Adolphe Adam’s delicate, dreamy score is given a carefully measured performance by The Orchestra of the Royal Opera House under the highly experienced baton of Boris Gruzin. Over and above her superb technical skill, Roberta Marquez has a delightful countenance, which makes her appear to be perpetually smiling. Steven McRae, a dancer at the top of his form, beams with the sheer joy of dancing. Together, the pair effortlessly captures the joy and heartbreak of the tragic, all too brief love story of Giselle and Albrecht. While McRae has a brief opportunity to display his flair for rapid, athletic moves, a great deal of the lovers’ pas de deux work involves slow, grounded, delicately expressive dancing. The pair are, of course, both more than up to this, drawing the audience into the romance with infinitely delicate grace. Their pas de deux at the graveyard, in particular, is achingly beautiful. Claudia Dean, as Myrtha, imperious queen of the Wilis, portrays her stern rule by keeping her face as mask-like as a painting while she dances the role with iron strength paired with graceful style. The female corps de ballet achieve incredible precision in their pristine work as the Wilis. 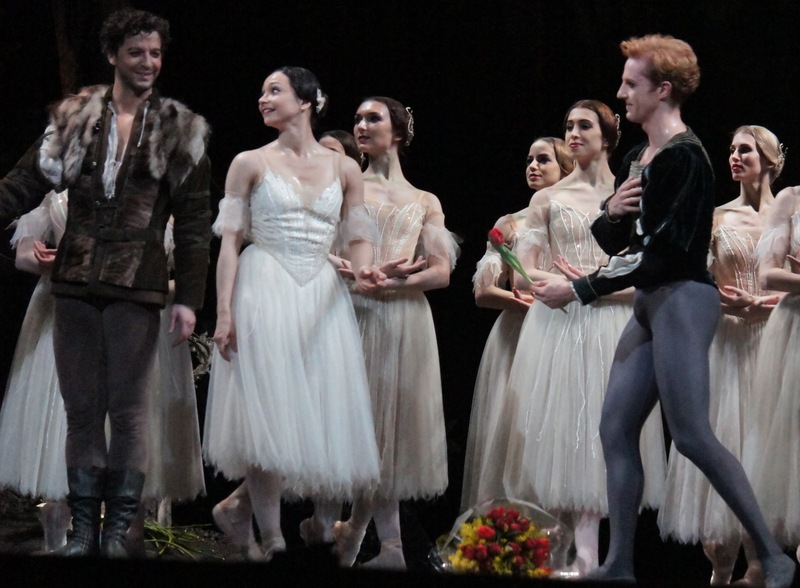 The Royal Ballet’s Giselle was reviewed at 2pm on 18 January 2014, the first performance of its current season at Royal Opera House, Covent Garden. It plays until 10 February 2014. It will be screened in cinemas around the world from 27 January 2014. As part of this winter season 2014, Man in Chair also reviewed Jewels, also starring Steven McRae. I really doubt we will get this at the cinema in Stillwater but I am hoping Tulsa or OKC will have a showing! Anyone know if there are plans to release this to DVD?